Nemecek is looking for help finishing the movie, which at this point appears to be interview footage with Harve Bennet and Walter Koenig. In other words, it’s not much a movie yet. In addition to financial assistance (for which donors will receive “cool swag” with the Con of Wrath logo, as well as screen credit in the finished movie), Nemecek is looking for photos and video from fans who attended the convention 29 years ago. There’s also a possibility he’ll take video submissions, but the details on that aren’t clear yet. For more information on donating and participating, check out Nemecek’s official Con of Wrath page on his site. Before seeing this trailer, I had no idea such an infamous Trek convention ever took place, so I would certainly be curious to see the finished documentary. Maybe not enough to donate money, though. I feel like I’m already doing my part with this blog. And I haven’t hit anyone up for donations yet. YET. Hey Redshirt, thanks for the shoutout. Cool name for the blog. The donations page is a Kickstarter-style opportunity for fans (but we use the Paypal donations system). We’ll have real financing, but it is a modest budget to beginning with and this just offers a grassroots-style option in the current mode. Believe me, I’m not a carnival barker. But It’s for those who want to help preserve Trek and fandom history, as I’ve been doing since the 80s with my projects and titles. As for “Wrath,” we’re about 10-15% into it, very eearly, and there’s much more footage–this was the first public peek at the celebs involved so far. 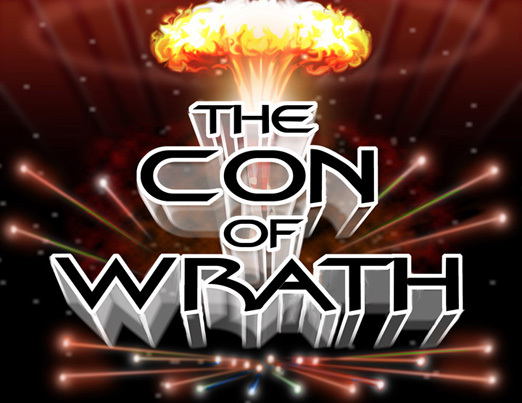 And the fact that you had no idea about the Ultimate Fantasy/ Con of Wrath… is exactly why we’re doing it, yes. Gotta preserve our fandom roots and leaders. Thanks again for the mention. Oh, and the tagline–that’s a long story. You should have seen what my marketing friends wanted me to use. Hi, Larry! Thanks for the comments! I’ve just been writing this blog in a vacuum, so it’s great to know at least one person has read it. I love the idea for the documentary, and I can’t wait to see it finished. Hopefully the trailer and the blog-o-sphere helps bring attention to it and things can keep moving forward. I’m still pretty new to ST fandom (that’s what this blog is all about), but the fans seem like the right group to rally together and help produce a love letter to fandom (even if it does tell the story of a “darker” side to the convention experience). Obviously, Star Trek and the fans persevered through the ’82 convention (I’m writing about it like it’s Chicago in the ’60s), and the means by which you’re spreading the word about the movie is a testament to that.